Slice the passion fruits in half. Use a spoon to remove the pulp and place in a strainer placed over a bowl. Press down with the spoon to separate the most juice from the seeds. Measure the juice (you should have 2 oz) and discard the seeds. 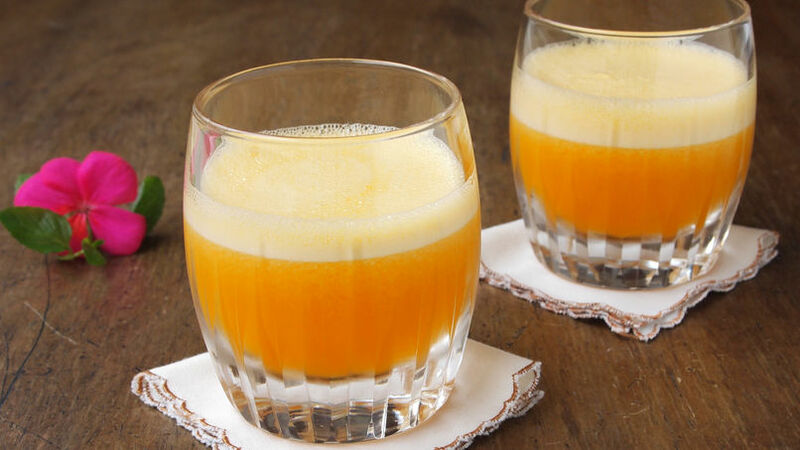 Place the pisco, passion fruit juice, simple syrup and ice cubes in a blender. Blend until foamy. You can make the simple syrup at home by combining one cup of sugar with one cup of water in a small pot. Heat, stirring until the sugar dissolves. Let boil for 5 minutes. Turn off the heat, cool, pour the syrup into a bottle, cover and refrigerate for up to two months. The Pisco Sour, Peru's flagship cocktail has a more colorful and fruity counterpart in the Maracuyá Sour. Actually, the maracuyá, or passion fruit, is one of our favorite fruits thanks to its wonderul aroma and its bold acidity, which lends itself to delicious drinks and desserts. This includes a variety of passion fruit-flavored cocktails that have benefitted from the exquisite flavor of this tasty fruit; in fact, for a while now, passion fruit has served as a substitute for lemon in our most traditional cocktail. The fruit needs to be ripe to get the best results for your drink. Check the skin to see if it's wrinkled, a good sign that the pulp is ready to be used. Also, when you buy it make sure that each fruit is heavy for its size. To use it, slice it in half and put the pulp in a strainer to separate the juice. You can also put it in the blender and process for a few seconds, being careful not to crush the small seeds. This cocktail has been a favorite at Lima's bars and restauarants for years, but it's also an easy drink to make at home. Just follow this easy recipe! If you're having a few friends over, keep the ingredients at hand; it's easy to scale your portions according to the number of people you're serving, and you can mix everything together in the blender. Finally, rather than serving your “passion fruit sour” in individual glasses, serve it in an elegant crystal jug and let your guests serve themselves.